A favorite dish from the town of Sulipan in Pampanga Province. At the turn of the century, Sulipan, or Apalit as it was then known, was famous for its haute cuisine. This delicious version is from Gene Gonzalez of Cafe Ysabel in Manila. 1 Soak the clams in lightly salted water for 15 minutes. Drain and set aside. 2 Heat the oil in a large pot or wok and stir-fry the garlic until golden brown. Add the onion and ginger, and stir-fry until the onion is translucent. 3 Add them clams and stir-fry over high heat for 1 minute, until the shells open. Remove the clams and set aside. Discard any clams that do not open. 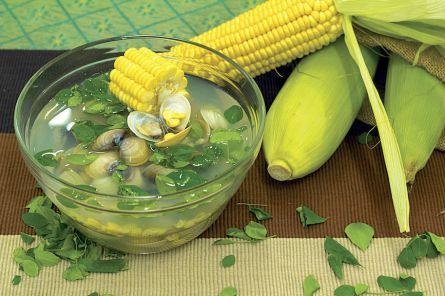 4 Add the corn kernels, clam stock and water to the pot. Mix well and simmer over medium heat for 20 minutes. 5 Season with the fish sauce and pepper. Increase the heat and return the clams to the pot. Stir to mix and cook for another 3 minutes. 6 Add the chili leaves and stir until wilted, about 3 minutes. Season with freshly ground black pepper if desired, and serve. Note: Young chili leaves should be plucked from the top of the chili plant. This unusual and delicate vegetable has a fragrant chili-like aroma when cooked. If unavailable, substitute with bell pepper leaves or spinach.